In the busy, buzzing newsroom of Dawn TV - Pakistan's first ever English news channel - there is an overwhelming sensation of urgency. Young, bright, talkative people, zipping around with cups of steaming tea in one hand, stacks of newspapers in the other. This hive of activity is where all the action is at. And getting a chance to watch history unfold through the headlines is what brought British Pakistani Addiel Sabir, 35, back to his homeland. As a journalist, he wanted the opportunity to report on the story of Pakistan, at a time when it is going through some of the worst political volatility it has seen in the last decade. Through the tale of his nation, he also wanted to find his identity. Mr Sabir arrived in Karachi a few years ago, quickly found a job as a presenter for Dawn Television and soon felt as if he has come home. "I don't feel I need to explain myself over here," he says as he applies his make-up in the green room, just before going on air. "I was forever justifying myself when I was in England. I found it difficult to find my own place, but here it's been a wonderful ride." Professionally it has been an advantageous move as well. "The media industry is hot right now in Pakistan," he says. "It's early days for the media industry here - but it's the best profession to be in right now. I would have never seen such a rapid movement in my career back [in Britain]." An informal survey around the newsroom of Dawn Television reveals that most of the young people here share Mr Sabir's sentiments. Many of them have returned to Pakistan recently, convinced that their economic future lies here in Karachi or Islamabad, where a lot of them feel more comfortable than they did in London or Paris. Soul searching aside, there are also obvious attractions of returning to a booming economy, where economic growth has averaged 7% or more for years. Take partners Arif Baig Mohammad and Pir Saad Ahsanuddin. The two friends left well paid jobs in the US to build and run a chain of multiplexes in Pakistan. They built the first multiplex in the country a few years ago - in Rawalpindi. Now they are planning to expand across the country. But the partners do point out that operating in Pakistan during this time of political uncertainty can be difficult. "I think Pakistan is going to be challenging in the short term - politically," says Arif Baig Mohammad. "We need some clarity on the political front. Economically as well, it's a little hard to say where we'll be in the short term, but the whole world is suffering economically right now. "In the long run, however, we're very bullish on Pakistan." For many young Pakistanis, though, it is a strong sense of duty that's drawn them back home. It was the idea of making a difference to his nation that prompted Kamil Aziz Khan to return to Karachi from the US a few years ago. 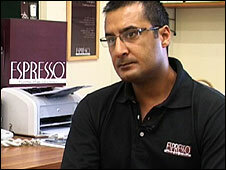 He set up a chain of coffee shops across the country. At his third outlet in Karachi, all around there are young, trendy and opinionated Pakistanis, sipping lattes and discussing politics. Many, like Mr Khan, have come back to their homeland only recently. It is Pakistanis like this, he says that have a responsibility to help build the economic future of their country. "The number of young Pakistanis coming back is amazing," he says, gulping down a double espresso. "They're still coming back despite the troubles you see on the TV. "They're young dynamic, full of energy full of concepts - and they can be any where else in the world, New York, Boston - anywhere - but they're still coming back. "At the end of the day your country is your country - you're not going to feel at home anywhere else." It is a refrain that is repeated this evening, at a barbecue television presenter Mr Sabir throws for his friends and colleagues at Dawn. 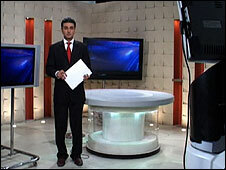 But politics, as usual, dominates the conversation, and the focus is very much on where Pakistan is headed next. 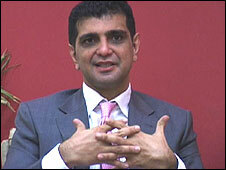 "It's politics and a cup of tea in this country," Mr Sabir says. "Everyone talks about it - all the time. And how can you blame them? No one's quite sure what's going to happen tomorrow." A sentiment I heard echoed by almost all of Mr Sabir's friends. Many debate the merits of the new government versus the old one, with no real consensus reached. All that is agreed is that there needs to be an urgent solution to Pakistan's political crisis, otherwise the economy will continue to flounder. 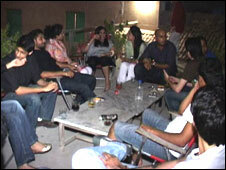 These young people are convinced that their future lies here in Pakistan. But whether that confidence will last is in the hands of Pakistan's new government.